The Czech style baroque gate, which is called after Maria Theresa, will be located at the Europe Place's northern side. 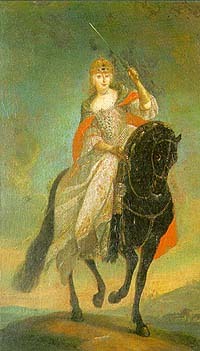 She is one of the few Habsburg rulers, whom history keeps in good memory, even though she comes from a foreign dynasty. She will always remain as the Queen of our countries. The Queen awarded the free royal town privileges to Komárno in a beautifully decorated document on 6th March 1745. This highly desirable award and the highest town status provided the town's further development and freed the town's inhabitants from the castle-commander's rule.